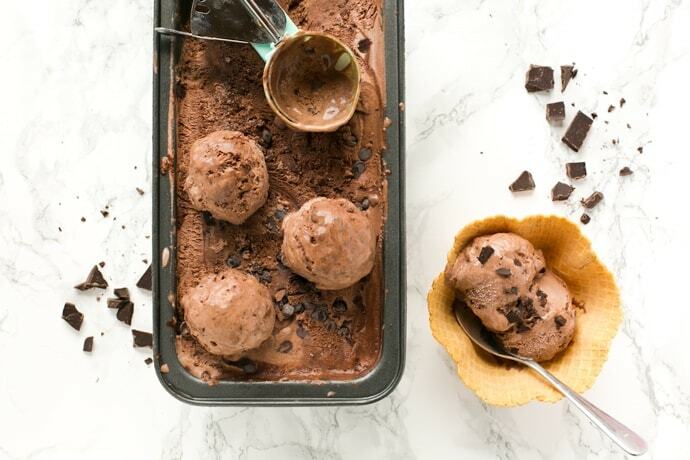 Skip the ice cream maker and go for this indulgent No-Churn Chocolate Ice Cream. 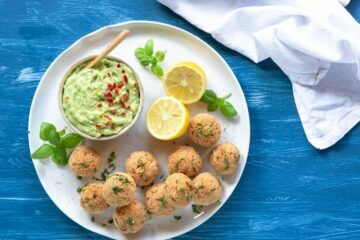 Only 5 ingredients required and it takes just 10 minutes to make! Over the years, I tried different methods to make homemade ice cream, from the classic Italian gelato to my popular vegan “nice cream” recipe. But since trying it, I have been completely hooked on this No-Churn Chocolate Ice Cream. This is probably the simplest method of all, and uses just double cream and condensed milk. Just two ingredients — that’s it! Plus, any kind flavours you like to add. For this No-Churn Chocolate Ice Cream I opted for a combo of dark chocolate and cocoa powder, and added chocolate chips in the end for extra texture. I’m super proud of this recipe, as it doesn’t get more “homemade” than this. 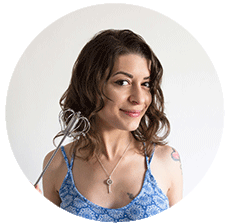 I prepared my own double cream (which I also use to make homemade butter) and condensed milk using easy-to-digest fresh whole milk from a2 Milk™. If you have never made your own condensed milk, believe me it’s SO worth a try. Making double cream and condensed milk from scratch is a bit more time consuming but definitely rewarding, plus you know exactly what goes in. If you’re not familiar with a2 Milk™, it’s an award-winning brand that produces milk naturally free from the A1 milk protein, which is the one that causes many health issues to people who are dairy intolerant. 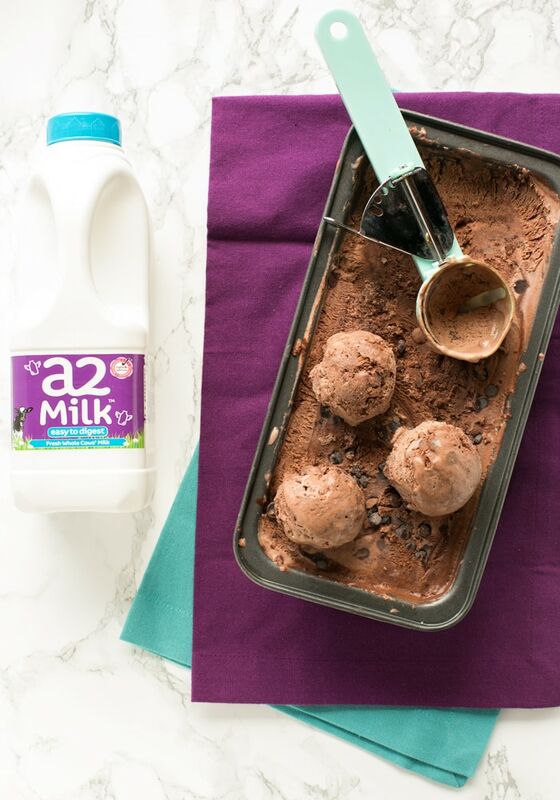 It’s no secret that I’m dairy intolerant, so I’m forever grateful that a2 Milk™ makes it possible for me to enjoy all kind of dairy treats without feeling unwell. They’ve also just won the Great Taste Awards 2017, so all thumbs up to this amazing brand! 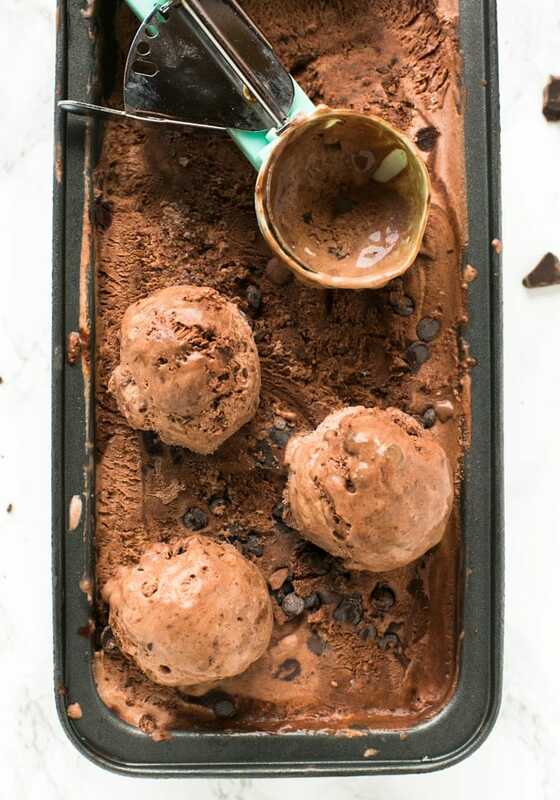 Back to this amazing No-Churn Chocolate Ice Cream, did I already say that is WAY TOO EASY to make? 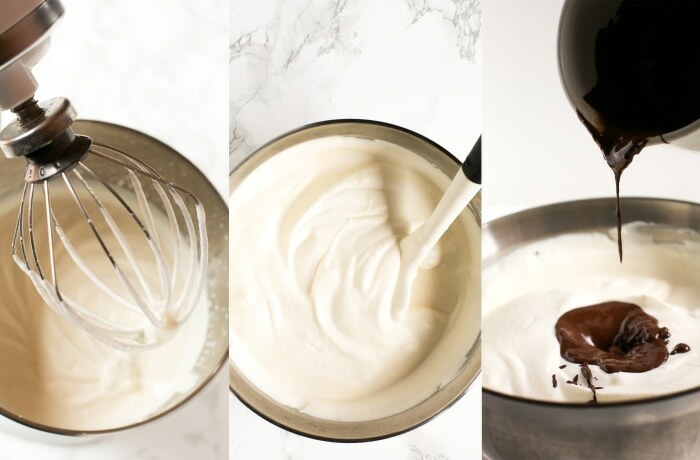 All it takes is a mixer to whip up the cream (but you can also do it by hand), then simply fold in condensed milk, cocoa powder, chocolate and vanilla extract. That’s the hardest part, really. Transfer the mixture to a freeze-friendly container (I like to use a loaf pan), freeze and just wait until the ice cream is ready. No cooking, No mixing and no churning involved. Only awesome, creamy, rich and smooth ice cream, ready to enjoy all summer long. If you’re looking for an easy way to satisfy your ice cream cravings, look no further. 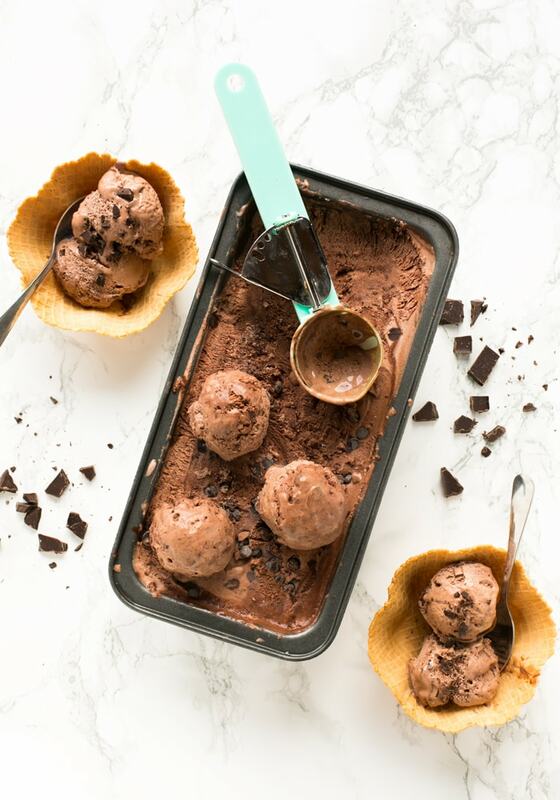 This 5-ingredient naturally gluten-free No-Churn Chocolate Ice Cream is easy, quick, completely fuss-free and 100% summer approved! In a large mixer, whip your double cream over high speed for about 10 minutes until stiff peaks start to form. 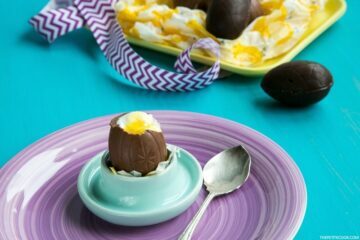 In another bowl, combine condensed milk, vanilla extract, cocoa powder and melted chocolate. Gently fold the whipped cream into your sweetened condensed milk, add chocolate chips and delicately mix everything together. Pour the ice cream mixture into a loaf pan and cover tightly with cling film. Place in freezer for 6 hours or overnight, then allow to rest outside the freezer for 10 min before serving. I ate half of it before it got to the freezer … it’s good ! after seeing this post i want to just eat icecream loved it !! Ice cream is my favourite food. Fact. 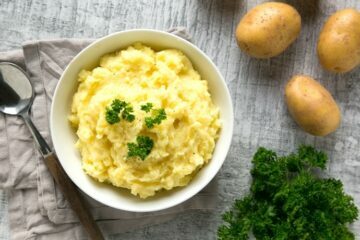 Perhaps I’ll have to try this simple no churn version soon! Especially chocolate flavour! This looks delicious and so chocolatey! I’ve never thought to make my own condensed milk before but it would be reassuring to know exactly what’s gone into it. Thanks!